Grabbing a rare moment of horse time with Nash. I’ve been quiet for longer than usual. I try to keep the discipline of writing twice a week, but there hasn’t been much to say lately. Actually, I’ve started several posts, but somehow can’t seem to finish them. Sitting is difficult, and computers just aren’t made to easily use while flat on your back! Add to that the lack of physical activity, the drama at work, and the severe reduction in horse time. It’s a formula for lack of inspiration and motivation. Yet, life goes on! The good news is that recovery is apparently going well. The doctor has been surprised by how little pain there is now. Of course no sooner had she said that than I had a minor lapse of attention earlier this week, and got a screaming reminder that I have a fractured vertebra! But ice packs have been my close companion for four weeks now, and they came to the rescue again. The worst part of this whole thing is the feeling of being nearly useless. I received clearance to basically do whatever I’m comfortable doing, and can do without pain, except: bending, twisting, lifting anything with any weight, or doing anything that could potentially lead to a fall. Those of you who live on a rural property, or take care of animals, will recognize just how limiting this program is! So, my poor mother has had to do everything – from all the barn chores to the laundry and dishes. Even stupid little things, like dropping a book, require help from my mother! Talk about feeling guilty! More recently I have been able to move, sit and stand for periods of time. It’s been a blessing to finally get outside. The first trip to the barnyard and Charles, our crazy rooster, gave me quite the scolding for being absent for so long! Inside the barn, and Noble trumpeted a greeting from his stall at the back. It’s nice to be missed! And he’s made it clear that he’s missed his scratches. Mom and Noble – what a good boy he’s been! Among the things my mother has had to do is take Noble out for turnout. With his history of breakaways, she’s been reluctant to handle him outside of the barn on her own. But the poor boy can’t stay locked up for a couple of months because I’m laid up, so she’s had to jump in with both feet. Well, they seem to have worked it out because young Mr. Noble has been getting his turnout every day. Along the way, he’s shown “grandma” just how smart a boy he is! Case in point: when it’s time to come in for his grain, he waits for grandma at the corner near the gate. Just off that corner is a post where his halter is hung. 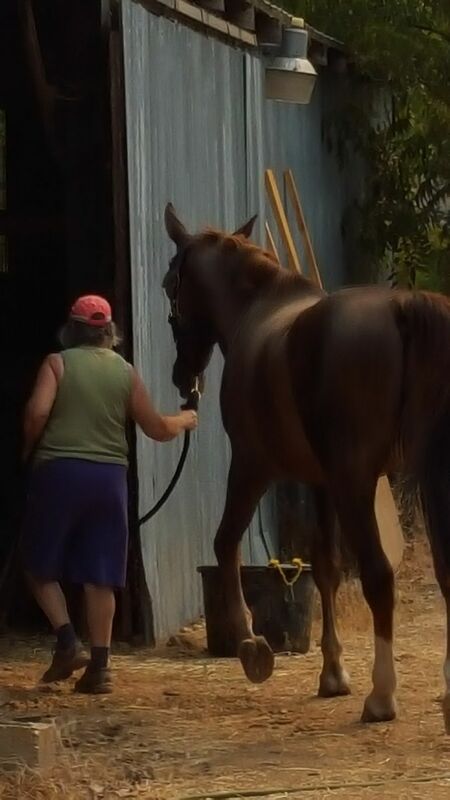 As grandma approaches, he reaches over the fence, nuzzles his halter, then looks back at her. On one occasion, when I wandered out there, and nuzzling his halter produced no result, he actually reached over again and picked up his lead rope then looked straight at me! Poor boy doesn’t know that I can’t risk handling him yet. Here is a little video where he first shows me the halter. When I don’t continue forward, he gets a little frustrated – but then he catches sight of “grandma” coming up behind me, and has to make sure she knows where the halter is. Clever boy! I have been able to get a little horse handling fix recently, thanks to good old Mr. Nash. Leading any horse is on the edge of those things I shouldn’t be doing. 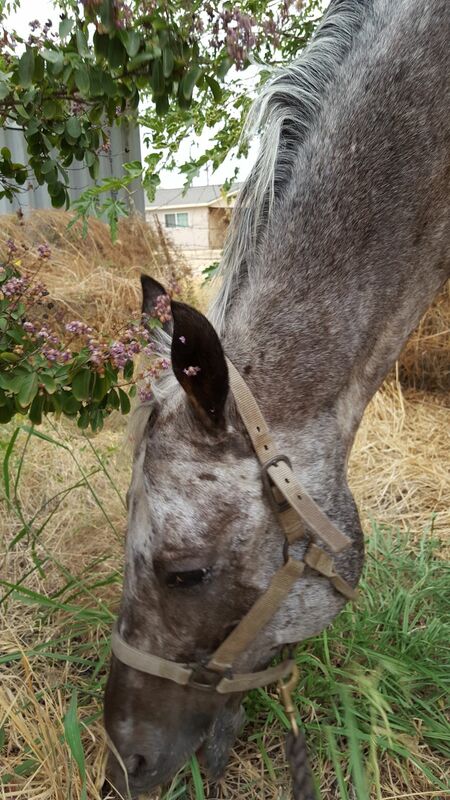 But Nash is the kind of horse that if I had to let go, he’d trot to the nearest patch of weeds and start to nibble. So, I’ve been able to pitch in by at least bringing him in from turnout. Or, perhaps more accurately, he brings me in. I mosey along, holding the end of the rope, as he traipses toward his paddock. Last night, after mom worked him, we moseyed between tiny bunches of grass. Nothing better for my soul than a warm horse body and the sound of peaceful munching! The last discussion with the doctor changed the timeline for recovery. As I said, I’m coming along better than typical, but each doctor I talk to has lengthened the time frame. So, it will take tremendous patience to get through an extended recovery – but a fractured vertebra is nothing to mess around with. At least now I can get a little bit of a horse fix in! I’ll try to be less of a stranger. This entry was posted in My Journey and tagged Charlie, chores, doctors orders, helpless, horse fix, injury, mother, Nash, Noble, patience, recovery, rooster, turnout. Bookmark the permalink. Happy that Noble is being good! (For his own good) and that you’ve gotten out there a bit. Give it all the time it needs to heal!